So Simple Minds are back with a new album, their first in twenty years. The first since they stopping making music after releasing decade defining hit, Don’t You (Forget About Me), in 1984. Right? Well no, actually. Don’t You (Forget About Me) was released in 1984 but, after a cursory glance at one of the internet’s most reliable encyclopedias, it transpires that Simple Minds never split up or really ever stopped making albums. Graffiti Soul is the latest offering from the Glaswegian band, their first since 2005’s Black & White 050505, and their 16th overall. That’s right, 16th. From the moment album opener Moscow Underground swings into view, it’s clear this is group who are feeling re-invigorated and, while they may not have hit top gear yet, they’re enjoying it all the same. What we get is a natural sounding album. It doesn’t overpower and is comfortable, clear and most of all exciting. While some of the songs may lack the killer melodies, the guitars sparkle throughout and Jim Kerr’s familiar vocals sound as strong and engaging as they did all those years ago. Lead single Rockets and follow up Stars Will Lead the Way are the standout tracks, and recall a sound that perhaps the band should be more recognized for. Opening with an U2 type guitar riff, Rockets shows the band’s ability for a good pop arrangement, but also manages to keep an edge that maintains it’s rock credibility, whilst Stars Will Lead the Way has the hook that probably deserved a much higher chart placing than that which it obtained (#88 in Germany). Light Travels is a bold song that takes us back to the mid 80s with subtle lyrics and confident drums, and is followed by Kiss and Fly, which has some of the cleverest guitar playing to be found on the album. However, to say that this album is without fault would perhaps be rash. Tracks such as Blood Type O and This Is It are relegated towards the end of the record and despite good intentions, lack the grace and melody of other tracks. There’s a nagging feeling of incompletion that surrounds these tracks, the feeling that maybe the band were happy to make a decent album, rather than risk creating a bad one. 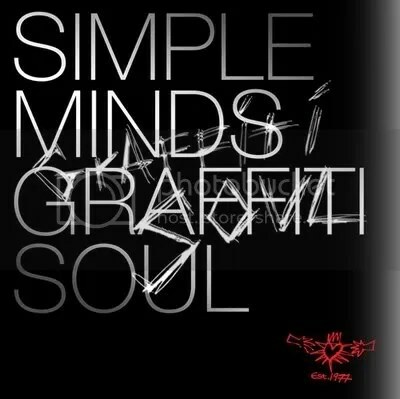 Nonetheless, Graffiti Soul is an excellent return and should be treated as such. It has more than enough quality to keep the older fans happy but contains the melody and grace that has Simple Minds sounding like they mean it again and deserves respect from a new generation of fans. Despite there being over 30 years since we first heard from them, the band are showing no signs of letting up. With a newfound enthusiasm and an excellent return to form, I’m very much looking forward to next 30. Below is an example of a great melody that is complimented by sparkling guitar lines and excellent arrangment.